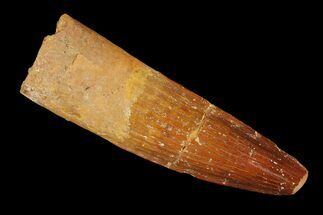 This is an authentic, fossil tooth from Spinosaurus maroccanus, the largest known meat eating dinosaur. 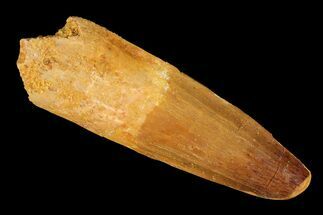 It is from the Kem Kem Basin in Morocco and is Late Cretaceous in age, approximately 95 million years old. 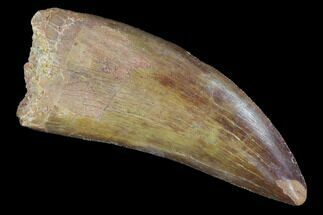 This is a pretty good sized Spino tooth. There is some restoration to the tip of the tooth and some gap fill restoration in the base, hence the bargain price. is one of the most spectacular and horrible creatures that ever stalked the Earth. Evidence suggests that is was semi-aquatic, so there was nowhere to escape from this fish and dinosaur-eating monster. 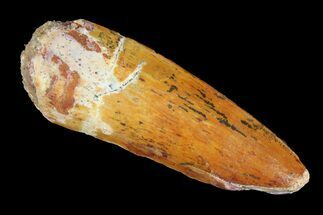 It belonged to a genus of theropod dinosaur which lived in what is now North Africa during the Cretaceous period, about 112 to 97 million years ago. 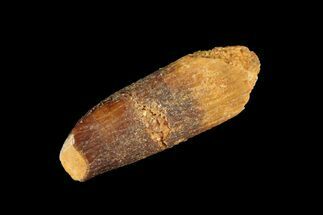 The original fossil evidence of S. aegyptiacus from Egypt was destroyed in WWII. 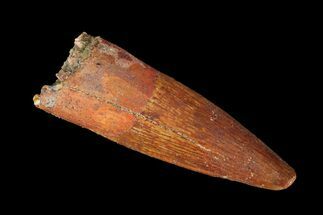 Recent finds have revealed a second possible species from Morocco, S. Maroccanus. Spinosaurus is currently the largest of all known carnivorous dinosaurs, even larger than T-Rex. While the exact size is debated recent finds and studies suggest Spinosaurus may have reached 41-59 feet in length and weighed in excess of 20 tons. Spinosaurus had distinctive neural spines, which were extensions of the vertebrae and grew to at least 1.65 meters (5.4 ft) long. While likely to have had skin connecting them, forming a sail-like structure, some authors suggest that the spines are similar in purpose and design to those of hump backed mammals. Thermoregulation, display, and added weight while in the water are other likely explanations for this remarkable structure. The massive, nearly 6 foot skull of Spinosaurus is narrow like that of a modern crocodilian. 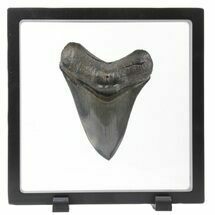 Indicative of a piscivore, it had elongated jaws, conical, unserrated teeth and raised nostrils. 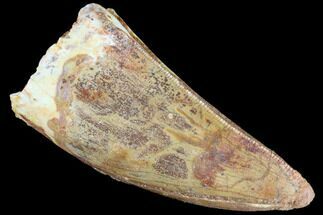 Isotope analysis of the teeth suggests a semi-aquatic lifestyle. It was likely a generalized and opportunistic predator, being biased toward fishing. Spinosaurus was a monster that lived among monsters. A picture of its life is pieced together with the gruesome contents of its meals and other macabre details of Cretaceous North Africa. Spinosaurus may have lived alongside similarly large dinosaurian predators such as Carcharodontosaurus, titanosaur sauropods, and the 33-ft long crocodylomorphs Stomatosuchus and Sarcosuchus. 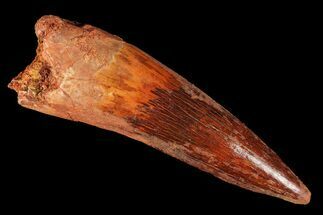 Spinosaurus teeth are relatively common fossils but large (over 3 inches), well-preserved examples are rare. 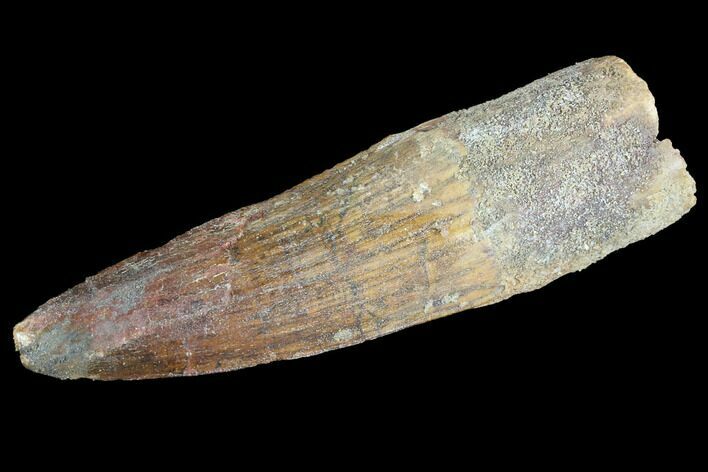 These large Spinosaurus teeth often times will be heavily doctored. I’ve seen many examples where multiple partial teeth can been glued to together to create a larger fake tooth, or where enamel has been painted on. One giveaway to look for is a ring of sand around the middle of the tooth that’s been glued on to hide a break. Sometimes this is a sign multiple partial teeth have been composited, other times its used to disguise a badly done repair job. 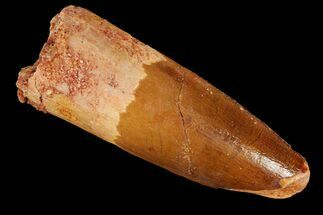 While there are some teeth on FossilEra for sale with these types of repairs or restoration, we are careful to note it in the descriptions and they are priced accordingly.